This boxing builds an A5 and an A8. The A8 had Nitrous Oxide injection from the factory so i'm starting with one of them. I'm not going to mess with the kit too much, just remove all the guns and associated bulges and then give it a fancy paint job. So far i've assembled some cockpit components and primed them and the fuselage interiors. ... and a ducted spinner like the prototype. And a cut down canopy! We're just here to help! Nah, it's too nice a kit to hack up. 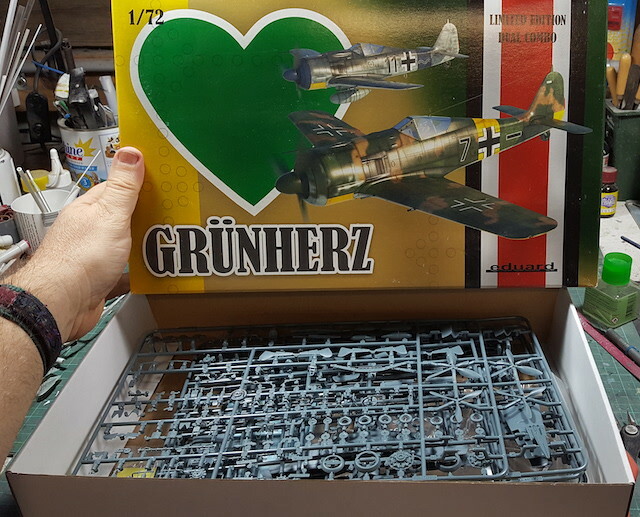 If I was going to do that i'd have started with the Airfix version which while also being nice is not as nice as the Eduard. This is going to be a straightforward relaxing quick almost OOB build with minimal PSR and no scratchbuilding. A palette cleanser if you like. Also, I realised I had bought a number of Eduard kits but hadn't built any of them yet. All done with PE. I can see why some people spend big on this stuff. It crossed my mind to put a tiny blob of something clear in each instrument but I decided that a) you won't see them when it's together and b) i'd stuff it up. How did you paint all those tiny switch things??? A half-bristle brush and an electron microscope? It's all pre painted (or more likely printed) PE Kit. I just had to remove it from the sprue and glue it on. Ooooh, that sounds alright then. They look terrific. I hope the altimeters's calibrated in meters though. 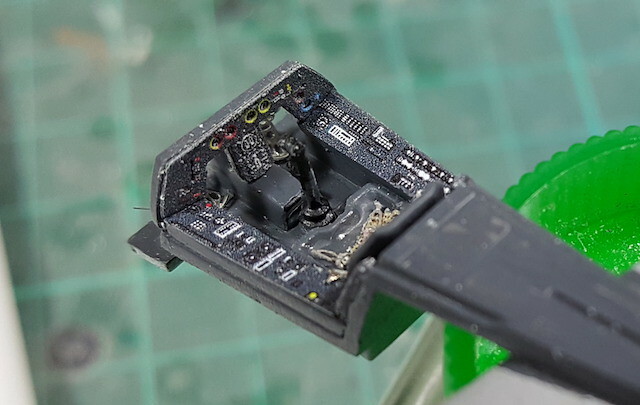 When it comes to etch I find instrument panels and seatbelts the most useful in 1/72 at least. The rest can disappear and is also beyond my eyesight. If you just want instrument panels then have a look at the Yahu range. They come ready assembled as well as pre-painted and you only get the panel, so no wasted fiddly bits and cheaper They are my first "go to" now. I have a couple of Yahu panels. They save a lot of work. There are some very small pieces on the Eduard sprues which I will not be trying to use. So I managed to lose the small upper instrument panel to which I had attached PE parts. Luckilly Eduard give you another one with moulded dials so I have attached that. So far I have got the cockpit installed between the fuselage halves along with the engine plate. Parts fit is very good but it's a slow process as i've found i've got to carefully make sure I maintain clearances and align everything or i'm going to end up with some big gaps. I've also been removing all weapons. Gun bulges have been removed from the wings and cowling, spent ammo chutes have been plated over inside prior to filling and I will fill the holes in the wings where the barrels were. On the PE front, I was having a look at the AMP Fairey Ultra-Light Helicopter kit today. The PE fret on that has some parts which are less than 1 mm long! How are we supposed to pick them up and put them in place without the required superglue binding the equally required tiny tweezers to the PE part? ?